Nothing novel or unique about this problem. This just extends the problem to measure the probability to three or more people sharing the same birthday using simulation approaches. Though there are other ways to approach this problem with built-in functions the example below shows some of the individual steps. 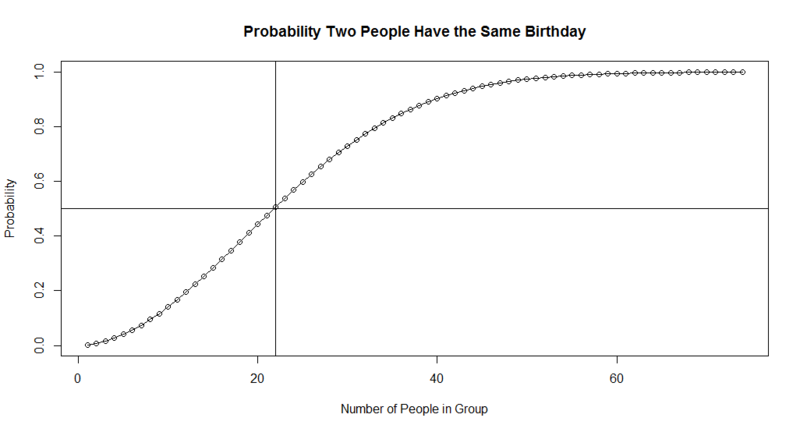 For two people it’s fairly straight forward and with a group of about 22 people the probability that two people share the same birthday is about 0.5. For groups approaching 50 there is an extremely high probability that two people share the same birthday. When determining that three (or more) people have the same birthday the probability decreases fairly quickly compared to measuring only two people. A fairly large group would be needed to find three people with the same birthday. Here is some R code to determine these probabilities. ## Runs a little slow. or try looking at ?pbirthday… Might speed things up. Look at that. There’s a function for the theoretical probability. Good to know.